I recently upgraded from the old Nokia Suite to the Ovi-branded version. In other word, I replaced one piece of sh***y bloatware with another. When you try to download a file from the Internet by using Windows Internet Explorer in a Windows operating system, the download stops responding and then times out. The problem occurs when you use a USB modem that has a data transfer speed that is faster than or equal to 240 kilobits per second (Kbps). Just look at that date. Microsoft found a problem that affects a good part of their customers (USB-based 3G modems are quite common these days), managed to cook up a solution, and seven months later it still wasn’t folded into the monthly updates and is still sold as a “hotfix”. 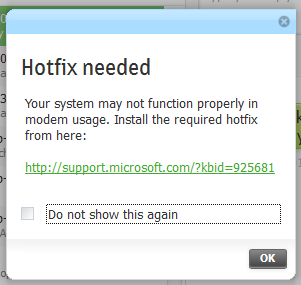 Sorry, this fix isn’t “hot” any more. It’s cold and very much over-due.